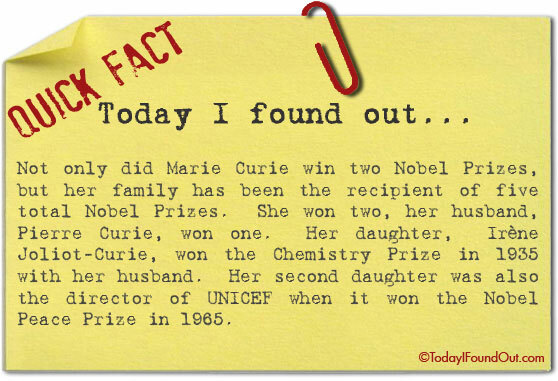 Not only did Marie Curie win two Nobel Prizes, but her family has been the recipient of five total Nobel Prizes. She won two, her husband, Pierre Curie, won one. Her daughter, Irène Joliot-Curie, won the Chemistry Prize in 1935 with her husband. Her second daughter was also the director of UNICEF when it won the Nobel Peace Prize in 1965. Marie Curie shared her first Nobel with Pierre Curie. Marie then won an individual Nobel. Irene Shared her Nobel with her husband. Eve’s husband then received a Nobel Peace Prize on behalf of UNICEF. So in all, the Curie family shared 4 Nobel prizes between 5 people. Prizes in all for the curie family. I fact the 1 st Nobel prize received by the Curie family in 1903 for physics was shared with Henri Bacquerel who received 1/2 of the prize money and the other half was shared between Pierre and Marie Curie. The fifth prize was awarded to an organisation, UNICEF, and to an individual. I don’t think it matters if someone “shared” the Nobel Prize. They are still considered a Nobel Laureate. The Nobel Prize for the Transistor was shared between 3 people (Shockley, Bratton, and Bardeen). All 3 are considered Nobel Laureates.